Any Upcoming Events that Wasp 3.02 will be playing in. Are there any Upcoming Events that Wasp 3.02 will be playing in. I felt somewhat robbed of the opportunity to witnessing it's true potential this TCEC and look forward to it's release. It's performance in TCEC Div 4 felt more like Wasp 3.5. Re: Any Upcoming Events that Wasp 3.02 will be playing in. 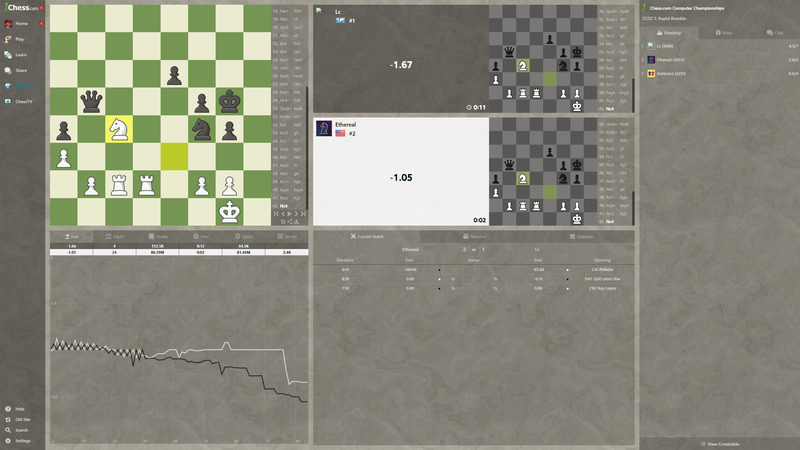 Chess.com is launching a new Computer Chess Championship series, including LC0 on a powerful GPU server. I've been trying to reach John Stanback to invite Wasp 3.2, but to no avail. His email address is not public. but unfortunately he is sick in the hospital and can't help in that regard. I certainly wish Frank a speedy recovery. If anyone knows how to contact John, help would be greatly appreciated. Have you tried PM (jstanback)? John has posted here recently. I replied to Norman's PM that I will submit Wasp 3.2 (or a newer version) for the upcoming chess.com tournament. This version is only about 20 Elo better than Wasp 3.0 in my testing on one core at ultra-blitz TC. I'm hoping to make more improvements before a public release. I think the main reason it did well in TCEC Season 13 as compared to Seasons 11 and 12 is that I fixed a bug and made a couple changes that had a big impact when using many threads but no impact for 1-4 threads. It's also possible that some recent changes to search extensions are more beneficial for long time control and/or more threads. The interface for CCCC looks nice. Do you have perhaps news from Frank? I hope he is better.